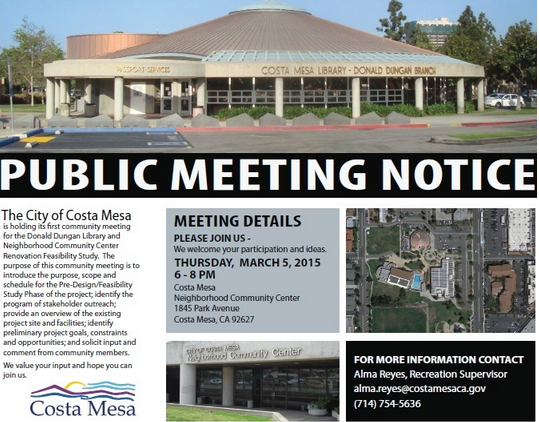 Tonight, at the Costa Mesa Neighborhood Community Center, 1845 Park Avenue (Lions Park), the City of Costa Mesa will hold a community outreach event to solicit opinions and ideas from members of the community on the plan to convert the community center into a new library and the existing Donald Dungan Library into a community center - a swap, as it were. This scheme has a full head of steam up, so if you wish to provide your views to the elected leaders and city staff, this is a time to do it. 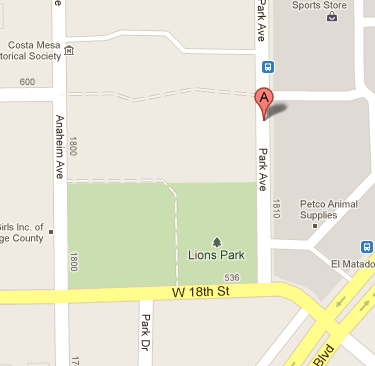 The meeting is from 6-8 p.m. See you there. 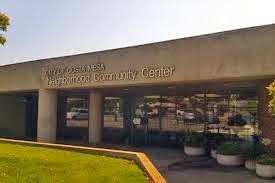 After finding out at the city council meeting that our city's financial status is not real good, it would behoove us, I would think, to put some money away and get our financial situation a bit healthier before we continue with the needless spending. A new library may be a wish list, but that's not a necessity at this time. Pay attention to the important things, such as Fireside Fund, reserves, and underfunded pension liability and then worry about wish list items.